For the past 23 years, the Key West Songwriters Festival has delighted locals and visitors with 5 days and nights of concerts and shows performed by hundreds of gifted performing songwriters from country, folk, pop, rock, and blues music. Fury participates in the festival by hosting exclusive concerts on the water with live music performed by some of the featured artists. Make sure to save your spot for these spectacular Fury events. *Artists subject to change without notice. Prices are based on single adult ticket price at time of purchase. Sales tax not included. Blackout dates & restrictions may apply. Discounts or promotions are not valid with these trips. It is necessary for Fury to collect your paid in full voucher and give you a boarding pass. This helps us maintain an accurate count for the coast guard. Children 15 years old and younger must be accompanied by an adult. 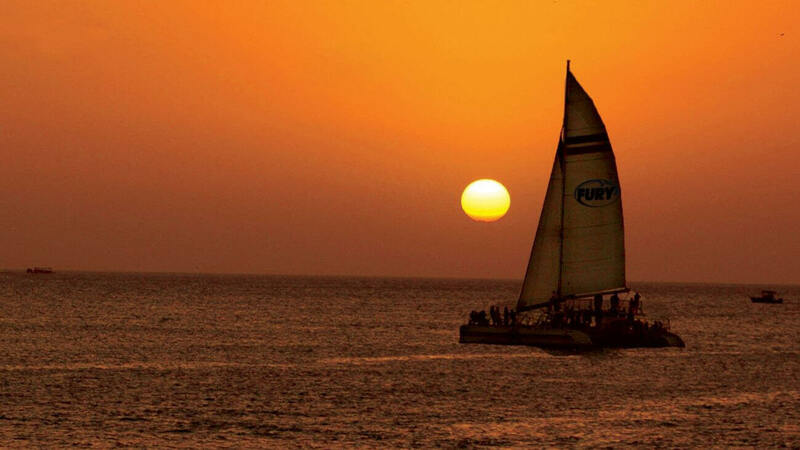 Children 16-18 may go on a Fury Sunset Sail unaccompanied, but only if they have a valid photo ID. The sailing catamarans have a spacious covered area that can accommodate many guests. WHAT BAND WILL BE PLAYING AND WHAT KIND OF MUSIC DO THEY PLAY? The band is dependent on the day. The music is an eclectic mix of songs and styles. It is a wide range of popular cover songs. There is something for everyone to enjoy. Can we dance on this trip? Yes, dancing is encouraged! There is a small dance floor in front of the band! DO YOU SERVE A FULL DINNER? Yes they are. We serve water, sodas, margaritas, champagne, beer and wine. WHERE EXACTLY WILL THE BOAT BE TAKING US? The exact location and route of your sail is dependent upon the wind and marine conditions. Your captain will choose the route that allows for the best view of the sunset. You will most likely sail by Mallory Square, Sunset Key and the Key West Harbor. IS THE COMMOTION ON THE OCEAN CHILD FRIENDLY? All of Fury’s sunset sail trips are family friendly. The Commotion on the Ocean has a very lively atmosphere. If you would like a more low key excursion, we suggest the Champagne Sunset Sail or the Glass Bottom Boat Sunset Sail.